On June 1, 2018, OneLogin will deprecate TLS 1.0 across all its endpoints. Please review the information below in preparation for this change. Over the past two years, several vulnerabilities surfaced specifically targeting the secure connection established between a user's browser and various web sites and applications indispensable to our professional and personal lives. As new vulnerabilities surface, technologies once considered "highly secure" became less so; consequently, providers must update their systems to address this change. Moreover, security standards and frameworks become more explicit in their requirements around SSL/TLS technologies in an effort to reduce exposure to these same vulnerabilities. We are providing advance notice so that you have time to ensure that your OneLogin users are using browsers that support TLS 1.1 or 1.2. We highly recommend that your users upgrade to the latest version of any of the major supported browsers, which use TLS 1.2 and have additional built-in safeguards to protect against known attacks. Important Addendum! Your users who use the OneLogin browser extension for Internet Explorer must have .NET Framework version 4.5 or later installed on their computers AND OneLogin Browser extension version 2.0.27+ installed. This version of the .NET Framework is not included by default with Windows 7. Please ensure that your Windows 7 users install .NET Framework version 4.5 or later if they want to user the browser extension. They must install the latest browser extension update. For more information, see Required Update for Windows 7 users with OneLogin Browser Extension for Internet Explorer. In some cases, an upgrade to the latest browser version isn't be feasible. To help you determine whether a browser upgrade or configuration change is necessary, we've provided the following list of supported major browser versions, along with configuration instructions when required. Contact OneLogin Support with any questions. Important!! Only ADC versions 5.0+ support TLS 1.1+. If you are not currently using ADC 5.0+, please upgrade your connectors prior to the OneLogin TLS 1.0 deprecation date. For more instructions on how to upgrade from ADC 4 to 5, please see Updating Active Directory Connectors. We plan to deprecate OneLogin Desktop for Windows 2.0 in the near future and introduce Desktop for Windows 3.0. Version 2.0 doesn't support the current versions of TLS, while OneLogin Desktop for Windows 3.0 supports TLS 1.1 & 1.2, ensuring a safe and reliable experience. Note. An exhaustive list of browsers and their level of SSL/TLS support can be found at https://en.wikipedia.org/wiki/Template:TLS/SSL_support_history_of_web_browsers. You can also test your browser's TLS 1.1 and 1.2 compatibility by launching https://www.ssllabs.com/ssltest/viewMyClient.html from your browser. Some devices compatible; others are not. Go to https://www.ssllabs.com/ssltest/viewMyClient.html from your device browser to determine compatibility. Compatible when running on Windows XP SP3, Vista, or newer, OS X 10.6 (Snow Leopard) or newer, or Android 2.3 (Gingerbread) or newer. Note. OneLogin's IE browser extension requires that .NET Framework 4.5 or later be installed. Windows 7 users may need to upgrade to .NET Framework 4.5+ to use the browser extension. For more information, see Required Update for Windows 7 users with OneLogin Browser Extension for Internet Explorer. Mobile IE 8, 9, and 10 cannot be made compatible with TLS 1.1 or 1.2. If you are using IE 8 or 9, you shouldn't be! OneLogin, like most other vendors, no longer supports them. 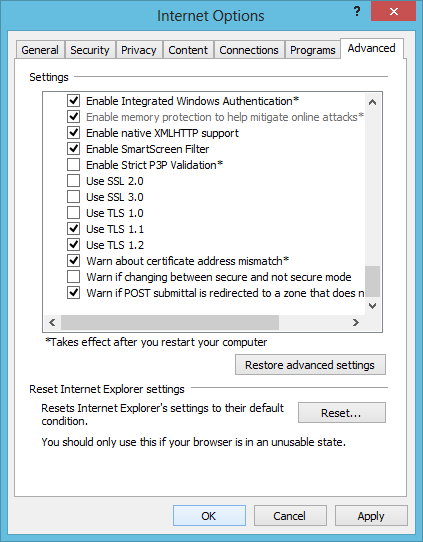 If you're using IE 10 on Windows 7 or higher, only TLS 1.0 is supported by default. You must configure the browser to support TLS 1.1 and 1.2. Click the gear icon on the top-right corner of the Internet Explorer menu bar. 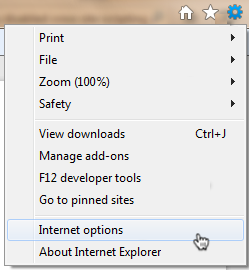 On the Internet Options dialog, go to the Advanced tab. Under Settings, clear Use TLS 1.0 and select Use TLS 1.1 and Use TLS 1.2. If SSL 2.0 and SSL 3.0 are selected, we recommend that you clear their checkboxes for additional security. If you use Active Directory, you can create or update a Group Policy Object (GPO) to manage your users' IE settings for domain-joined machines. In the Options window, change the Secure Protocol combinations setting to Use TLS 1.1 and TLS 1.2. Apply the GPO to the appropriate OUs in Active Directory. To support TLS 1.1 or 1.2, OneLogin's Internet Explorer browser extension (v2.0.27+) requires that .NET Framework 4.5 or later be installed. All Windows operating systems after Windows 7 already support .NET Framework 4.5 or later by default. Windows 7 users who use OneLogin's IE browser extension must update their browser extension and may need to install .NET Framework 4.5 or later. If you are running Windows 7, verify that you are on Windows 7 SP1. Verify that you are running .NET Framework 4.5 or later. To upgrade to the latest version of OneLogin Browser Extension for Internet Explorer, see "Installing the extension" in OneLogin Browser Extensions.